Celebrate the earth with these fun seed bombs—clay balls containing seeds. Simply toss anywhere there’s dirt, and wildflowers will spring up. Making the balls is fun and brings out the kid in everyone. Wrap them in pretty fabric and hand them out as gifts. Start by putting 2 cups of clay in a medium-sized bowl. Add the compost and knead with clay. This process can take about 5–10 minutes. Pulling apart smaller parts of clay helps to push the compost into the clay. Repeat this process until all of the compost is mixed with the clay. Pull apart sections of the compost/clay mix and make 1-inch balls. Put ½ cup of seeds into a shallow bowl. Flatten each ball and dip one side into the seeds and roll back into a ball with your hands and set aside on a tray. Cut 15 7-inch x 7-inch pieces of fabric and set aside. Get some scrap paper and cut a 1-inch circle with scissors, or use a large hole punch if you want it perfectly round. With a pen, write a cute love note to nature. We wrote, “To Mother Nature.” Punch a hole at the top. Cut 15 pieces of twine, each 1 foot, and thread them through the labels that were created. Place a ball in the center of one of the pieces of material. Bunch the sides together and tie a bow with a piece of twine at the top of the seed bomb. 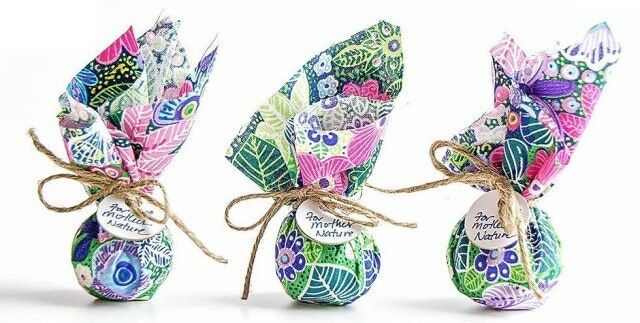 Now you’re ready to gift your seed bomb or use it in your garden or while hiking; just unwrap and toss into the dirt.